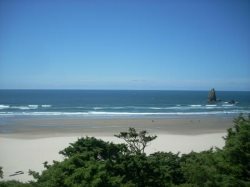 The staff of Cannon Beach Vacation Rentals are very friendly, gelpful, professional and overall terrific. The property we stayed in was made even more wonderful by the wonderful service we received. They even brought us sunshine for the majority of our stay. Thanks to all. We sure hope to come back. Great working with your staff. Friendly and efficient. My family will use Cannon Beach Vacations for our next visit to Cannon Beach. It was extremely easy working with CBVR and everything aligned with what was promised. Staff were friendly and knowledgeable. We loved the house and the overall location in the Cannon Beach area. It was an extraordinarily relaxing and laid back vacation and we plan to return to the area another year. The folks we talked to over the phone where exceptionally friendly and helpful. Overall the rental company was great and the place was amazing! Will make this reservation and trip time after time!! for the many years that we having been booking with your company we have never had a bad experience. everyone is always very helpful and have gone out of their way to answer our questions.